You know, chemistry is kind of a big field. I say that because I’ve been actively reading the chemical literature for over thirty years now, and I still keep running across topics that I never knew existed. One of these popped up the other day: racemic protein crystallography. Now there may be a few readers who are all “Oh yeah, sure, you’re just getting around to that?”, but for everyone else, think about that term for a minute. Prepare yourself for a weird excursion into chirality and crystallinity. Protein crystallography, sure – great stuff, although known to be infested with voodoo and all that. But racemic? The idea of a racemic protein is a bit weird, because that means a 50/50 mix of enantiomers, and proteins are, of course, pretty much all made up of the naturally (L) amino acids that living cells use crank them out. To get an all (D) protein, you’d have to have a supply of all those unnatural enantiomeric amino acids (which you can buy, albeit not so cheaply). But you’re not going to be able to depend on any cells or ribosomes to make them for you, since we don’t have any mirror-image life handy, so chemical synthesis it is. And that’s doable, too (although the larger the protein chain, the trickier it gets). But the next question you might have is why anyone would want to go to all the trouble. And there we get into some crystallography. If you look at all the basic ways that things can be arranged in three dimensions, with careful attention to what directions and how you’d have to move your basic units around to make them repeat, you are listing “space groups“. And here chemistry (and physics) impinge on pure mathematics, because good ol’ three-dimensional space has 230 different space groups: that’s all there are and there ain’t no more. There are several different ways to arrange them and more than several notations for them, as that last link will show you, but mathematically, that’s what we have to work with. If you sit around your whole career crystallizing things, you will eventually encounter every single one of them, although (to be sure) there are definitely more and less common ones. But if you do nothing but crystallize proteins, you poor person you, then you will only encounter 65 of them at most. Those are the chiral space groups that don’t have any of the slightly fancier symmetries in them, such as inversion centers or mirror reflections, because chiral protein chains simply cannot be arranged in ways that will allow those things to happen. And as it turns out, if you look at all the protein crystals known and bin them out into those 65 space groups, the P212121 group is pretty heavily over-represented, and a few others are right behind it. That link goes into what seems like the explanation: entropy. Those space groups allow for more degrees of freedom, which means that there are (in most cases) simply more opportunities for proteins to fall into that sort of pattern. Now if you were to go to racemic proteins and crystallize those, you end up with 165 possible space groups, which means that crystallization should, in fact, be easier in general (since there are more ways for it to happen). And since protein crystallization (as it stands) can be a barren wasteland of heartbreak, this is good news. The statistics for globular proteins are that about 30% of them can be crystallized through brute-force experimentation, but only about two-thirds of those crystals, at best, give enough high-quality diffraction data to be useful. But it really does look like the success rates for racemic crystallization are higher: greater than 85%, actually, which is just unheard of. An outstanding example is ubiquitin, a relatively small and very biologically important protein that is a major pain to crystallize. Its structure was determined in 1987, but as I understand it, almost everyone who studied its crystalline form since then did so by obtaining seed crystals from that original successful team (!) Synthesis of the enantiomeric protein made a dramatic difference: a standard screen of protein crystallization conditions on the racemate gave diffraction quality crystals in half the wells after an overnight run. Recently it was shown that this even applies to ubiquitin oligomers, which have been considered particularly intractable. The racemic-protein idea was proposed in 1989 and first achieved in 1993, and it’s been gathering momentum ever since. The same paper that explained the current protein space group bias predicted, through the same considerations, which new space group(s) would become the most favored as more racemic proteins were studied and according to this recent review, they’re right on target (between 40 and 50 examples are known to date). The prediction was also made that membrane-bound proteins might be difficult, since they have fewer protein-protein contact points than soluble proteins tend to. Work in this area is still at an early stage, but so far it looks like you can get X-ray structures for such things, but that they might differ (on a macro subunit-assembly level) from what occurs in the real membranes. This is all great if you can get past the brutal synthesis part, and that last review and this shorter recent overview go into that issue. What’s really made the difference in recent years is “native chemical ligation” chemistry on shorter (and unprotected) protein subunits. It’s still not something you undertake lightly, but it’s a lot more feasible than it used to be. And that’s a good thing: protein crystal data is extremely useful (although not quite the Word of God in all situations) and anything that allows us to get more of it, particularly in the tough cases, is welcome indeed. Addendum: I can’t resist noting the first time I ever came across the idea of a fully enantiomeric protein, which was when I was about 14 years old and reading James Blish’s (rather odd) one-off short Star Trek novel, Spock Must Die. Blish (as always) couldn’t resist working his own interests into it, so you have oddities like Uhura being a devotee of James Joyce and Finnegan’s Wake in particular, which raised my eyebrows, Spock-like, even as a 14-year-old. At any rate, a key plot point is the emergency trial of a souped-up long range transporter beam that sends a copy of the person involved. Spock gets into the thing – mind you, they should have tried it on a box lunch of roast beef sandwiches or something first, but that’s the 1960s Star Trek – and the beam ends up unexpectedly reflecting back and producing an apparently identical Spock, to great consternation, not least because there’s some confusion about which one is the original. One of the two ends up barricading himself inside Dr. McCoy’s laboratories for reasons unknown, and when they discover that he’s the duplicate, one proof is that they find that he’s been in there synthesizing enantiomeric proteins and carbohydrates in order to survive. That reflection reversed him down to his molecular chirality, you see, so. . . I read that book when I was 10! Stuck with me long afterwards and led to a big a-ha! moment when I got to organic chemistry a few years later and understood what he was talking about. “Technical error” is an Arthur C. Clarke short story about an engineer in a new power plant getting inverted in an accident and needing synthetic nutrients to survive. To save money, the managment decide to invert him back with disastrous consequences. To be fair, management told him – quite truthfully – that they’d be willing to go to the huge expense of trying to keep him alive, but that they probably wouldn’t be able to synthesize all the vitamins he would need. So he agreed to try to be re-mirrored. In _Doorways In The Sand_ by Roger Zelazny, our hero finds himself inverted. As I recall, to his mirror self, terrible coffee was still terrible coffee but cheap bourbon was incredible. pure speculative question here, and perhaps because this is the first time I have heard of this field as well: could this be a possible reason, perhaps, why there is nearly all one (L) and not the other (D) in the world, because the racemic mix crystallizes rather quickly, and over time if there is even a slight bias towards L it would self-accelerate by not crystallizing and actually being useful and functioning. (Or vice versa, but something back when tipped it to very slightly L rather than D, and so we have mostly L). Donna Blackmond at Scripps has worked on exactly this idea, and it seems plausible. One of her many papers on the subject is linked on my name if you’re interested. This was my first thought, too. That sounds like a very extreme difference in behavior, and since life is so heavily biased towards L proteins. . . well, it doesn’t mandate that there is an evolutionary advantage, but it certainly does point in that direction and whisper loudly, to steal a quote. “Keeping proteins from crystallizing out in the cell” certainly passes the basic sniff test. I recall the same idea being used in George O. Smith’s Venus Equilateral story, “The external triangle.” The solution was to beam people to their destination via some intermediate location. The first zap reversed them; the second reversed the reversal. Yep, read that one, too! Those were classic “Edisoniade” stories, where people constantly invented themselves out of trouble in blazingly fast order. . . The really great thing about an all-D version of a protein drug target is that you can find binding peptides that are all-L by phage display. Those peptides, made as all-D peptides, will then bind the original, all-L target. And because the peptides are all-D they will be much less subject to proteolytic destruction than normal peptides. “Mirror image phage display” is crazy but it works. Of course, you are still stuck with a peptide as a starting point, so there is a lot of work to do to make a drug out of it, but hey, hire some chemists! Naive questions here: how do you know that the racemic protein you can crystallize is otherwise similar to the original one you’re interested in? 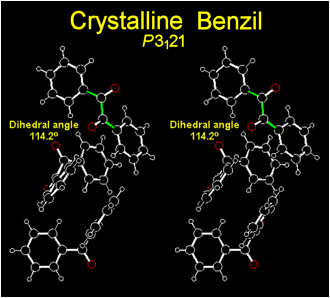 If its easier crystallization is due to its ability to assume different structures, how much do diffraction studies of those crystals tell you about the original structure of interest? I read dave w’s Q differently. Is the rac crystal structure the same as wild type L? A common Q about many xtal structures is their relevance to native solution phase structures. In this sense, the D-protein might distort the L-protein (and vice versa) just as if it was a small molecule, impurity or other annoying blob. Pure L (and pure D) might normally be very helix-y. Rac protein might isomerize (each other) to be very sheet-y. Not such a naive question, actually. It’s one that’s always worth asking about protein crystals in general, especially if you’re looking at things out on the “edge” of each protein, where it makes contacts with its neighbors. In the wild, it’s surely not making those. Fortunately, we’re usually concerned (in drug discovery, anyway) with somewhat more buried parts of the structure, which are generally less like to be distorted. But there are no guarantees. As for the easier crystallization, though, it’s not that the protein adopts so many different shapes. It’s that the shape it already assumes has a lot more ways to drift into forming a crystal, because there are a lot more crystal packing styles that are open to it and can potentially work out. The holy grail, of course, would be to build the enantiomer of the ribosome. But in all seriousness, if/when scientists succeed in building all the parts for a mirror DNA/RNA/protein world, wouldn’t there be some risk that it would escape into the wild?? Doesn’t seem dangerous to me. What would it eat? There are some cyanobacteria that produce D-amino acids, but they don’t threaten to take over the world, except for a few lakes and streams. I should have been more clear that these cyanobacteria are not all D-amino acids in their proteins. They just produce a few D-amino acids and incorporate them in some of the crap they produce. An inverted organism could still eat non-inverted proteins and sugars, it would just have to break them down to non-chiral building blocks first such as pyruvate. Would this actually work? I was under the impression that D-proteins were very, very harmful to known life. Is this mistaken? And it might not have the ability (that is, enzymes) to be able to do that. The non-inverted stuff might be just so much roughage, in the worst case. Also some not-so-cyano bacteria incorporating them into their cell walls. It’s not just pathogenicity. Invasive species can wreak havoc on an environment simply by existing. Absence of predation and parasitism is one of the main factors that lets a species go invasive. Even a simple soil bacterium that overpopulated could reduce the biodiversity of the soil, and thus its nutrient availability to plants. It’s worse than that. George Church is actively working to develop industrial bacteria that are immune to all viruses. He’s changing the genetic transcription code enough that non-modified DNA/RNA will produce completely non-functional proteins, by converting one of the codons into a STOP. This should completely prevent viruses from replicating. IIRC he’s starting on E.coli which is far too flexible (survivable) for safety IMO. When I first read about this, several years ago, I contacted people at his lab and was told things like “It’s safe because E.coli doesn’t live in soil” which is simply not true. So I told a few people who worry about existential risks for a living and have far more impressive credentials than me, and let them worry about it. But I’m still worried. Ubiquitin is actually crystallized very easily, but if and only if the thing you are trying to crystallize is actually a ubiquitin binding domain + ubiquitin complex instead. Then you will get a lot of pointless ubiquitin crystals, the better to make you hate life! But where would the mirroring stop? Mirrored symmetry at the subatomic level would lead to antimatter, would it not? No. Electrons and positrons are fundamentally different particles. ‘Spin’ in the context of physics has little to do with mirror-orientation as described here. Saw a case of it at Body Worlds exhibition. Huh. Non-chemist here. When reading about chirality or “handedness”, naturally the way a layman would think about it is in “left” or “right” terms. So when I saw “L”, of course I expected the other to be “R”. But it’s “D”. Assuming “L” does not stand for “Left”, what does “L” & “D” stand for? Dextro- and levo- from the Latin dexter and laevus, meaning right and left. So ‘L’ does stand for left, but in Latin and not English. For more. Gotta be real careful with chiral nomenclature. L-amino acids have the same relative configuration as Levorotatory L-glyceraldehyde. However, L-amino acids can be levorotatory or dextrorotatory (eg Leucine alphaD -10.8; isoleucine alphaD +11.3). Using the R and S notation defines the absolute stereochemistry regardless of the direction of rotation of polarized light. Consistently dimerizing a persnickety protein with a short (rigid) linker would afford C_2 symmetry. Though still chiral, it would be prone to crystallize. “three-dimensional space has 250 different space groups” “there ain’t no more” 230 periodic space groups. Quasicrystals are 3D projections of higher dimensional order, and have other 3D space groups. 65 Sohnke space groups in the 230 can contain resolved chiral moieties. 11 pairs of enantiomorphic space groups with the 65 are themselves chiral. The unit cell will be resolved chiral – independent of contents. Tellurium follows; benzil also cheats (end). … the atoms form homochiral threefold helicies. … Benzil. All the fun is in the footnotes (even if pi-stacking is something else). I assumed that D stood for dexter, which meant the right hand [dextrous, etc — scroll to the “Did you know?” section here: https://www.merriam-webster.com/dictionary/dexterous%5D.